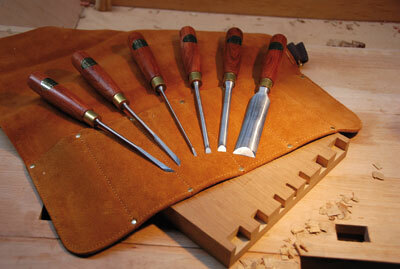 Everyone aspires to beautiful crisp hand cut dovetails. Not everyone realises that the tapered design of dovetails for furniture requires a little bit of thought about the tools that you use. The normal chisels that you use for rectangular sided joints won't really work as they cannot easily get into the corners - it is not impossible but it is difficult. Where I trained the solution was to grind your own specialist dovetail skews from old chisels. Well, now Ashley Iles have done the hard work for you. 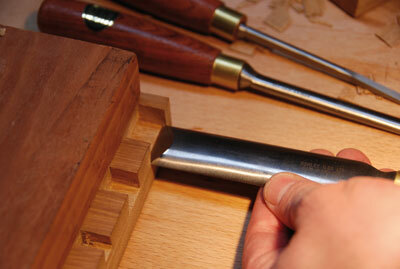 Matthew Platt at Workshop Heaven has sent F&C a set of six specially made dovetail chisels to test. The design was a combined effort between Barry Iles, Joel Moskowitz from Tools for Working Wood, and Matthew. The set contains two 1/4in cabinetmakers' fishtail skews, left- and right-handed for either side of the sockets, and by the way, you will find yourself reaching for these tools for other cabinet making and restoring tasks as well. Then there are four graduated straight chisels with rounded backs (shoulderless chisels) in 1/8in, 1/4in, 3/8in and 1in widths. All have bubinga (Guibourtia demeusei) handles and come in a nice solid leather tool roll, which has seen quite a bit of use in the F&C toolbox and so far shows no signs of being unable to protect its contents - some tool rolls are a bit flimsy! The broad 1in chisel will clean right up to the edges of the socket and the fishtail cleans the back wall and into the corners. The photograph below shows the 1/4in chisel being used against a paring block, which is a reliable way to get the bottom of the sockets to the same gauge line. I see lots of dovetails where the line is exceeded. Using these chisels won't necessarily improve bad technique but they will make getting accurate results in the confined space of a dovetail socket much easier, so they are worth investing in a set. Personally, I'd be quite reluctant to send them back to Matthew! "They will make getting accurate results in the confined space of a dovetail socket much easier"